This is a picture dictionary that can be handed out to get aquainted with the vocabulary and to learn it or if you want to practise it, students can be asked to color and cut out these pictures and use them as flashcards to review. 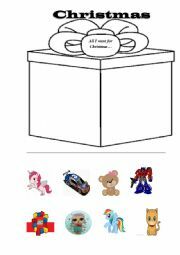 Kids can choose presents they really like, then cut and stick them inside the present picture above. As feedback they might be asked to present their wish list or to ask Santa what they want. This is a matching activity,students learn to read the samples and to associate pets and sounds they make,so logic and reading skills are practised. 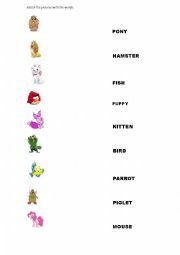 This is an activity for students to match disney pets pictures with words, it helps to practise pets vocabulary. To do it students have to read the words, so it improves reading skills and logic. 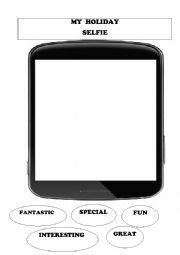 There are 2 activities to show the attitude to different things by using both positive and negative adjectives. You may use the idea itself and adapt the tasks according to your students level. 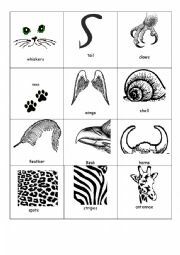 This is a set of slides animated with the pictures of different animal body parts,the appropriate vocabulary words are also provided to further better learning and reading skills practice. In this ppt students describe what the most popular Nickelodeon characters are wearing, hope your students will like it! the last slide contains three pictures to play �guess who� game, one student chooses a picture and describes the character,while the others guess which one is talked about. The 3d part of the feelings presentation with animated slides. This PPT represents different actions animated with beautiful disney pictures,that makes it attractive and easy to understand. Each slide is also provided with the appropriate action words to help students memorize the vocabulary. this is the first part of personality presentation,the ppt includes animated disney pictures that helps the students to see the right meaning of the vocabulary and popular cartoon characters makes it motivating for better learning. This ppt is organized as a continuation of the personality presentation ppts, the main purpose of it is to practise the vocabulary learnt from the previous ppts. Students are supposed to use the appropriate form of the verb to be in their answers. this is the 3d part of the personality presentation with bright animated slides that helps your students easily understand the meaning of the words and motivate them to learn the vocabulary. 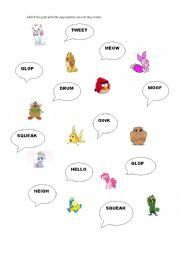 this game is created to practise the pets vocabulary spelling. the picture and the short description are given as a variant for different level students,for those who can�t read only the pictures can be used as a prompt. the students read the hint sentence and try to guess logically the appropriate body part. Thanksgiving quiz is a kind of activity to review how much your students know about this holiday. Enjoy!